Lamprey, often called eels because of their snake-like appearance, are native to the Pacific Northwest, where they have important cultural and economic significance. Three species have been identified in the Columbia River: Pacific, river and western brook lamprey. Pacific and river lamprey are anadromous and parasitic; western brook lamprey spend their lives in freshwater and are not parasitic. Lamprey have a special significance to Indian tribes, who use the fish in ceremonies and celebrations. Historically, tribes maintained large lamprey fisheries at the confluence of the Snake and Columbia rivers and also a short distance downstream from that place at the mouth of the Walla Walla River. Lamprey also were harvested in great quantities at the base of Willamette Falls on the Willamette River. The tribes dried or roasted lamprey; the oil of the fish was used as a medicine and also as a hair grease. Lamprey also played an important role in the ecology of the Columbia River and its tributaries, contributing nutrients to the water as the fish died and decayed and serving as prey for other fish. Fish biologists discovered around the turn of the 20th century that ground eel was an ideal food for young salmon in hatcheries. Today, lamprey are significant for their bitter-tasting but protein-rich flesh and oil, which is processed into animal feed, and also used as a source of medicinal anticoagulants. While precise data is difficult to acquire, incidental evidence suggests the current populations are declining, apparently significantly, from historical numbers. The primary factors for the decline appear to be passage problems at dams for both juvenile and adult fish, destruction of spawning and rearing habitat, a coincident decline of prey fish for lampreys and intentional poisonings of streams to eliminate unwanted fish. 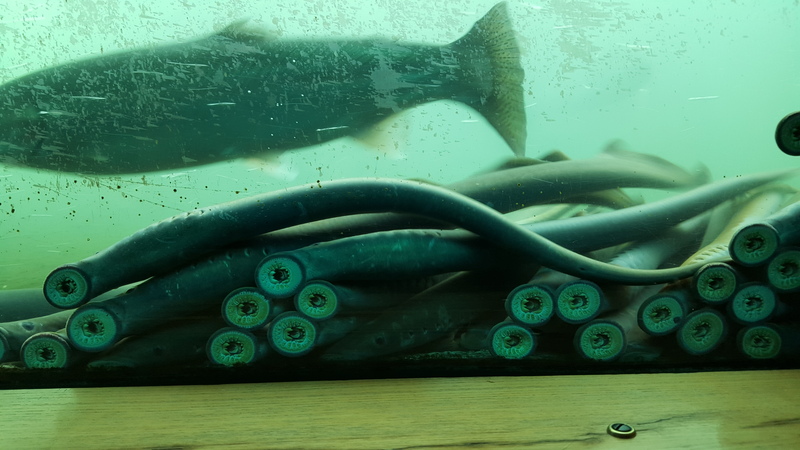 Lamprey at Bonneville fish ladder window. Photo: Tony Grover.